← An Interview with the Jayman! The weather the last couple days has been sunny and beautiful. We’ve even gotten up to a balmy sixty degrees. The girls are dying to break out their summer clothes, but I’ve decided to make them wait just a bit longer. (In my former life in San Diego, I would’ve thought I was freezing to death at this temperature!) The earth is coming back to life. Flowers are popping up and all the trees are in full bloom. I find it simply delightful to watch. The other day, while I was having sweet conversations with the daffodils and looking up admiring the cherry blossoms, I felt something move beneath my shoe. Startled, I glanced down and found to my horror that I could no longer see my feet! They had become buried under long tendrils of grass. My yellowing lawn (lawns just don’t die here) had suddenly decided that it was going to become a jungle! I declared then and there that I would mow the lawn…tomorrow. When I got up at the crack of dawn the next morning, I checked the weather as I always do. I’m sure you can just imagine my disappointment when I read that it was going to rain. Everyone knows you can’t mow the lawn in the rain. Apparently it will set off some sort of Voodoo Curse on it…or something like that. (Don’t even argue with me on this!) As the sun started to rise in the sky, it was revealed that not only was it not going to rain, it was going to be (Gasp!) sunny out! Drats Lucky me, I could mow the lawn after all. Then I noted that Shaun was having a very late start getting out of the house. I knew he hadn’t been feeling well, so I figured that he must have called in sick. Sadly, I wouldn’t be able to mow with him home because that would stir up the pollen and really mess with his allergies. (Isn’t it convenient that he managed to develop severe allergy problems about the same time we moved into a house with a lawn? Hmmm….) It turned out that Shaun had been working from home to fix a major bug, but was still planning on going in to work. Foiled again I’m so glad my sweet husband was feeling well enough to go in. It seemed I had no choice but to haul out Big Red and dust him off. Now Ol’ Red has only been with us a couple years. He’s a pretty good mower, not quite the riding mower I couldn’t quite justify getting,(but really, really wanted) but he’s pretty tough. Although it did seem as though he wasn’t quite ready to wake up from his long winter nap. As hard as I tried, I couldn’t get him to start for the life of me. When I pulled the start cord, Ol’ Red just growled at me and went back to sleep. I checked his oil and gave him new gas…still he just growled. I cleaned out all the dried grass that was stuck in his blades (I guess I thought he would bathe himself like a cat when I put him away last fall) finally, after putzing with him for quite a while, he decided to wake up and get to work. I know that it is just barely Spring, but I can’t help but feel that Summer is on the way. This entry was posted in Adventures, It's all about me!, Random stuff. Bookmark the permalink. I hate mowing lawns. Of course I live in an apt. so I don’t have to mow. It’s such a hassel. I think if I ever buy a house I’ll do some dessert landscaping. Or some Brady Bunch Astroturf. 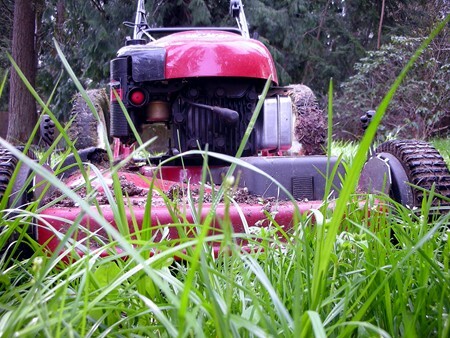 That was the most fun I’ve had in a long time thinking about starting a lawn mower and mowing the lawn. You wrote that so well, Susan. Your enthusiasm is so fun. I must admit to being fervently anti-lawn, though. We’re gradually working on turning all the grass into perennial gardens at our house! Oh mowing really messes with my alleriges! Its the worst. I would give anything for a riding mower! Lucky you! oops, forgot to say I love the pic of Big Red. He looks mean and ready to take on anything. Jay~Astroturf, what a great idea! Annie~Thanks, I just wish it would’ve waited a while to start growing. Jocelyn~ Enthusiasm? lol I’m thinking it’s about time to do some landscaping type stuff..the girls don’t really run around out there much. I know what you mean about a freshly cut lawn. It is one of the true signs of spring!